A ten card set for only 15 bucks + shipping. Hot off the press and ready for delivery. States side deliveries are expected in early Nov. Just in time for the HOLIDAYS!!! PERFECT TEACHER GIFTS, GIFT EXCHANGE, BIRTHDAY GIFTS, AND KEEP SOME FOR YOURSELF! Blank folded cards -perfect for Thank you notes or any simple greeting. (from US to US and from Switzerland to Europe and beyond). 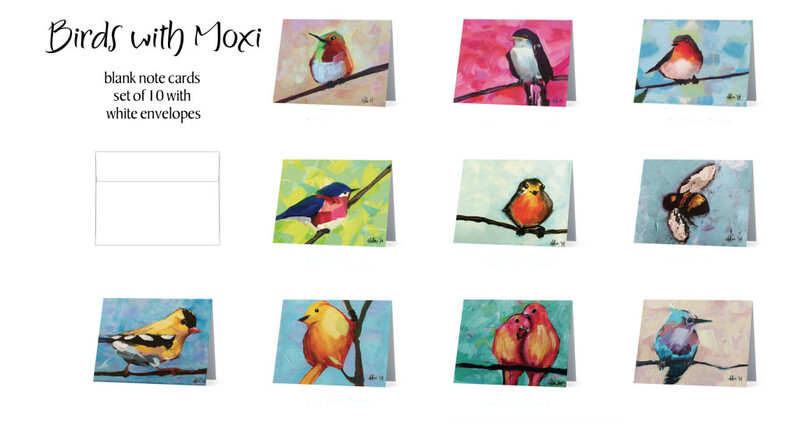 Each set of 10 comes with 10 5.5 x 4 horizontal folded notecards with matching envelopes. Each set is professionally printed on matte card stock (easy to write on) and is ready to brighten anyones day. TO ORDER contact holleethornton@yahoo.com or message me from FaceBook. This entry was posted in ART and tagged Birds and the bee, Cards for sale. Bookmark the permalink.